The discovery of penicillin in 1928 brought about a sea change in the approach to disease and surgery. A first revolution was even earlier, in the mid 1800s, when hygiene and the use of antiseptics entered medical practice. Before Lister’s 1867 discovery of the dramatic effect of using carbolic acid to sterilise surgical instruments, there was no saying whether a person undergoing surgery would recover from the procedure. Even with antiseptics, however, medical science was powerless against a host of pathogens. While epidemics that broke out from time to time took a heavy toll, casualties in the battlefield were often more from infection of wounds than the battle itself. This also changed, with the second revolution, the discovery of penicillin and other antibiotics that followed. The virtual conquest of bacterial infection, thanks to antibiotics, however, is in danger of being reversed because many pathogens have started developing resistance to antibiotics. The race is hence on to find new antibiotics faster than pathogens can evade them. The trouble is that antibiotics are complex molecules and the sources are normally molds, fungi or plant-based. This is the context of the report by Zihua Lin, Xiaobo Xu, Sheng Zhao, Xiaohong Yang, Jian Guo, Qun Zhang, Chunmei Jing, Shawn Chen and Yun He from Chongqing, Huanguai, Tsingua and Chongqing Medical Universities, in the journal, Nature Communications, that a method has been found to produce a class of antibiotics that pathogens would have difficulty in finding ways around. The way antibiotics work is that they do to the pathogen the same thing that the pathogen does to the body cell. Now, the intelligence of body processes is all contained in the profiles or surface features that cells and chemicals present to each other. Thus, an enzyme switches on a function of a particular cell by attaching to the portion of the cell, which the structure of the enzyme exactly matches. It is this “lock and key” mechanism that makes biological processes both highly specific as well as efficient. The bacterium also makes use of the same machinery, of being able to attach to or enter body cells, to block or divert body processes. The antibiotic, in turn, uses the same machinery to thwart the pathogen. Mainly by chance, certain substances, found in infinite variety among plants, are able to act against some bacterial and pathogenic organisms. Over centuries, some of these were identified for their curative action, as folk remedies. That the molds, or the fungi that grow on old bread, had an effect on infected wounds, for instance, was known. That is what led Alexander Fleming to discover penicillin. Methods were then developed to create penicillin, and other compounds of the same nature, by culturing samples or by biological processes, like fermentation. Antibiotics, effective against most known diseases caused by bacteria, are now known and manufactured. The trouble is that the bacteria affected by antibiotics also need to survive and the intelligence built into living things gets active. Over several generations of bacterial reproduction, there are occasional offspring that are not exactly like their parents in some significant respect. If the difference is in a vital feature, of course, the offspring do not survive. But if the difference is in the feature that the antibiotic uses to identify the bacterium, for instance, the newborn has an advantage. While the normal bacteria get killed off, the new strain faces less competition for resources and grows in numbers. If the antibiotic is used frequently, this could result in the old strain being replaced and we have an epidemic of a “resistant” bacterium. With rampant “off the counter” use of antibiotics, even use for fattening cattle, more bacteria are proving resistant and there are “superbugs”, which resist most known antibiotics. As the sources of antibiotics are mostly in plants, or biological processes, the quest for new antibiotics, to combat resistant pathogens, has to be fresh assays of plant sources or possible modification of the biological process. Advances in microbiology and genetics have helped but there has been no breakthrough in synthesising a “made to order” antibiotic. The advance that the group from Chongqing, Huanguai and Tsingua report is synthesis of a naturally occurring substance that uses a body substance, on which the bacteria themselves depend, to smuggle itself in and destroy the bacteria. This class of substances is called sideromycins, as they are attached to siderophores, the substances that bacteria need. Siderophores are molecules that can attach to iron, and bacteria secrete these to harvest iron from the environment. Iron is vital for all life processes but is rarely available except in the form of oxides, which are not soluble in water. 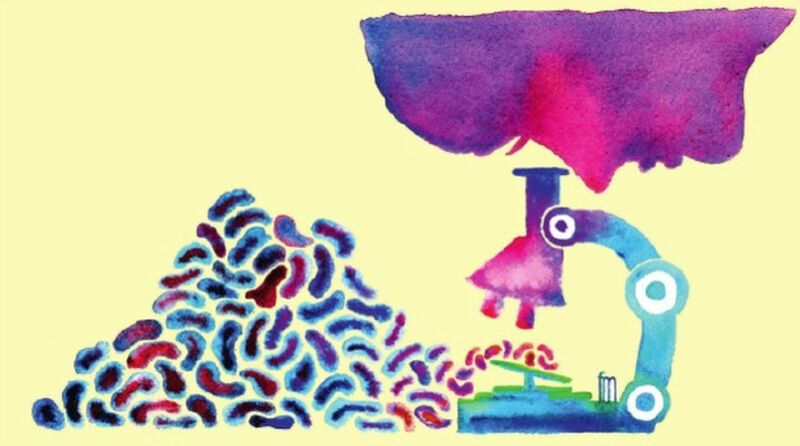 This is why bacteria need this special machinery to go out and get it. The advantage of using siderophores in drug delivery is that siderophores have free passage through the bacteria walls. A sideromycin, an antibiotic attached to a siderophore, can thus be effective at low doses and would clearly present a challenge to a bacterium to develop resistance. The paper in Nature Communications says that a few naturally occurring siderophores have been discovered. Among them are albomycins, which were first isolated from a soildwelling species of bacteria, from which several antibiotics, including streptomycin have been derived. Albomycins have been found to be effective against several disease causing bacteria, and against pneumonia and E coli infection, they are 10 times as effective as penicillin, the paper says. The point of the paper, however, is that the team has succeeded in total synthesis of three albomycins, which show potent activity against multidrug resistant bacteria that cause pneumonia and MRSA, a virulent form of Staph.”The minimum concentrations required were well below those of ciprofloxacin, vancomycin, and penicillin G, and in a number of cases reaching 1,000 times lower”, the paper says. Their success has opened the door to synthesise other forms of albomycins, the paper says.